More makers are setting up stalls on Makerhood in the run-up to Christmas. Here’s an introduction to the latest batch. 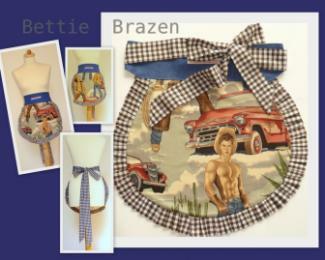 Bettie Brazen is a Brixton seamstress offering deliciously kitsch hand-made vintage print pinnies, cushions, bags, bunting and book covers. Dia Batal‘s artworks are inspired by Arabic text in freestyle Arabic calligraphy. Le Petit Type produces cards on an Adana 8×5 letterpress from designs that start on the computer and are converted to magnesium printing plates. Trip Stylist designs ready-made and tailored day-out guides and self-guided walking tours around London and the UK. Yoga with Chris offers CDs on relaxation and gentle yoga designed to help you focus on breathing, body and space.